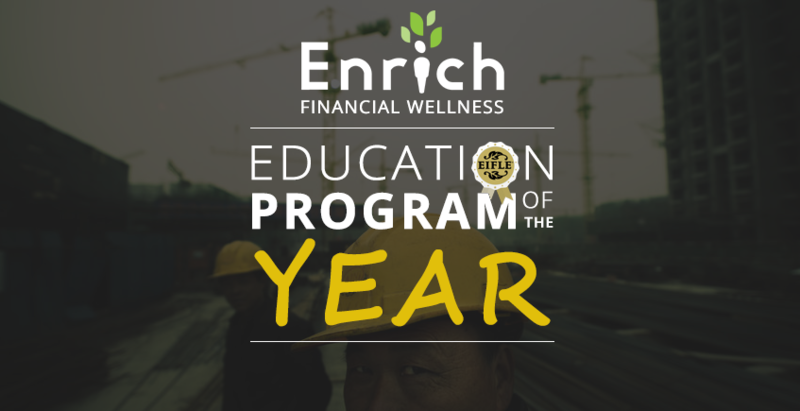 SAN DIEGO, CALIF. iGrad, the leading provider of financial wellness in higher education, is awarded top honors for its workplace financial education platform through Enrich.org – the Enrich platform wins the 2016 “Education Program of the Year” award from The Institute for Financial Literacy. In a 2016 survey by AONHewitt, 56% of employers reported they are very likely to focus on the financial wellbeing of their employees in 2016, up from 30% in 2014. The top two reasons for this increase in focus were that “it’s the right thing to do” and “to increase employee engagement”. Although financial wellness programs have clear benefits for employers, the Enrich white-label financial wellness platform was created primarily to improve the lives of employees. A recent study conducted by Financial Industry Regulatory Authority (FINRA) concluded that almost 60% of Americans households still don’t have at least three months of savings at hand. The Enrich white label platform allows employers and companies to integrate the online program with their own websites, employee assistance program, or personal finance management system to create a familiar, trustworthy and seamless experience for employees, customers, family and staff. The Enrich platform employs adaptive and interactive models to curb behavior and maximize engagement. Users have access to resources such as videos, games, personalized action plans and articles - with fresh content added daily by expert contributors like best-selling authors Sharon Lechter and Terry Savage. “We now have a deep understanding of how to help people achieve financial wellness and enrich the lives of our learners but we want to take every opportunity to have an even greater impact,” says Alban. Jennifer Robison of the Gallup Business Journal reports that workers with low wellbeing can cost employers as much as $28,800 in lost productivity as a result of sick days in comparison to the $840 in lost productivity of those who reported high levels of wellbeing. Gallup research teams have spent more than 50 years in partnership with leading economists and psychologists studying wellbeing and have concluded that financial wellness is an essential element for a thriving, productive employee. The Institute for Financial Literacy - a nonprofit organization established in 2002 - created the Excellence In Financial Literacy Education (EIFLE) Award to promote the effective delivery of consumer financial products, services and education by acknowledging the accomplishments of those that advance financial literacy education. EIFLE winners last year included Experian and FINRA. Empowered by their success working with over 600 schools and 1.2 million students in higher education, the iGrad team hopes to impact the financial wellness of a much broader audience – with Enrich. In launching Enrich, the company partners with employers, financial institutions and benefits providers to provide a financial wellness program which is tailored to the unique needs of individual groups and users. The white label co-branding allows companies to integrate the platform with their own website, employee assistance program, or personal finance management system, creating a familiar, trustworthy and seamless experience for employees, customers, family and staff. Today, the adaptive learning platform serves over 1.2 million students across 600 schools and organizations around the country by providing a campus-wide financial literacy program that assists students in learning to manage (student) loans, understand the dynamics of affording a home, paying credit card bills, investing, budgeting and planning for emergencies. The platform also offers schools the ability to augment personal finance and financial literacy courses currently taught in the classroom.